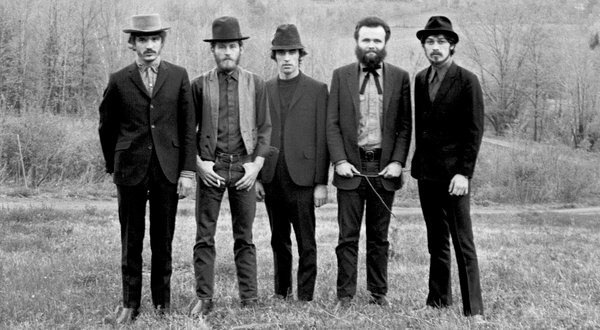 This is not going to be another obituary for Levon Helm. If you want to read such, the absolute gold standard for obituaries, chock full of stories about Levon Helm, was in the New York Times. Read it here. This triggered my own memories of The Band, Bob Dylan, and a time in New York when I was young. No, I wasn't a folk groupie, or a Woodstock alumna, or even a starry-eyed kid waiting for Bob Dylan's next record. I was in my late 20s, an actress working at temp secretary jobs in New York. I was married to an actor, Jim Vann, and we were both Dylan fans and idealistic folk music fans. We were just a little older than Dylan's demographic, but we loved hippies and thought of them as an exotic new species on the horizon. We thought they were the hope of the world. We were almost the only people we knew who didn't smoke pot or experiment in the drug scene. I had a temporary assignment as secretary to an executive in a little music company. This was a mainstream company, classy offices, upscale address. All I did was a little steno and typing, and it was only for a couple of weeks. It was on Madison Avenue, I believe, maybe up in the 50s. I wouldn't know the man I was working for if he walked in the door today, but I can remember this: He was related to the Gershwins, and he was trying to persuade one of the daughters to give him the rights to record some of the brothers' recently discovered music. This would have been a huge get for him as the very young head of a small New York company. He was enthusiastic to the point of obsession about the prospect of making it big in the business. 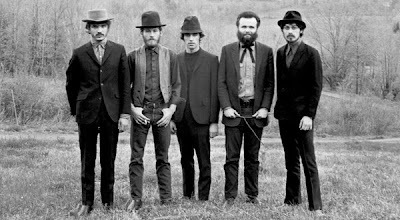 When he learned a bit about my musical tastes, he told me about this great new sound, the band who used to be Bob Dylan's backup, who had rehearsed in a pink house in a remote town near Woodstock. He waved the album "Music from the Big Pink" at me, played some of it on his fabulous sound system, and after work I went out and bought the album. The music was like nothing we'd heard before--and we had heard a lot of Bob Dylan, so we had heard some strange stuff. It was hard to think of these guys as a backup band for anybody, their sound was so unique. I'll never forget it booming at me on those huge speakers in that office. Years later my brother, who had been at the University of Alabama at the time, told me that The Band had been booked to play at one of the fraternity dances the night before the big game with Auburn. He said they blew the audience away by focusing on their job, playing their kind of music, and at the end the leader--my brother said it was "the one with the big head"--simply said,"Good night. Hope y'all win your ball game." This was a departure at the University of Alabama, where the bands know all the dances are partly football pep rallies (indeed, it might be argued that most of university life is a big football rally). It is expected that, if not playing "Stars Fell on Alabama," at least most of the night will be devoted to local chauvinism. The Band had a different agenda. I still have one vinyl and one CD of The Band. The music doesn't sound a bit strange or revolutionary to me anymore. It was part of an era, a shred of hope against all odds, combining sounds of the past and an uncertain present with the defiant throb of the future. The era has ended. We have all moved on in spite of ourselves. The music pulls us back and slings us against the walls once more, but more gently now, as if the walls were nothing but a distant memory. I'm at a point in my life where I'm forced to let go of old friends. It's not easy to do, and sometimes, as in a particularly well-written obituary, I'm drawn back to a place and time I had almost forgotten, and I have to do it again. Let it go; let it be. Rest in peace, Big Pink. The scene is a church hall in Hoboken, New Jersey, where a former Broadway dancer is instructing a modestly talented class in the art of tap dancing. Each of the class members came for a different reason, most of which we learn during the course of the evening as we watch them magically become almost good--and we are pulling for them every minute. Hudson Theatre Ensemble's production of Stepping Out by Richard Harris warms the heart and sets toes to tapping as it takes the audience through a labyrinth of frustrated hearts and semi-broken lives, all looking for an escape through tap dancing. As is to be expected from this excellent troupe, under the direction of Laurie Brongo, the play is fun and crisply performed. Cristina Marie plays Mavis, the catalyst as dance teacher, who is sympathetic and wise even though she is going through a crisis of her own in her real life. Marie is a dynamite actress and dancer, coaching the clumsy and talented alike. Somehow we know all along she's going to get the best out of all of them. The script is predictable although it contains many little side trips and not a few unsolved mysteries and unresolved conflicts. But never mind about that. Life is better if you dance, isn't it? The cast is interesting and each plays his and her own story at a professional level while admitting that if life wasn't so bad outside they wouldn't be here trying to tap dance. Even the pianist is frustrated about something, although it's less clear what. Dinah Gravel plays her quite seriously, with a bit of a sarcastic edge. I would have liked to have seen her really playing the piano, but I guess that's too much to ask. She had the role nailed, even with piped in music. Florence Pape is always a joy to watch onstage, and the audience loved her as Vera, the bossy control freak to whom tap dancing is an escapist pastime. Other characters have more serious problems, like Emma Peele whose husband beats her and who gets a powerful dramatic scene that brought the role into sharp focus. Gregory Nye played the only male in the class with a studied unease that made his inept dancing appear to be good acting. In some cases I couldn't tell--and in this show it didn't matter. The house was packed on opening night, and the air conditioning was faulty, which was a bother. Pacing could have been picked up in the first act, but that will all be worked out by the next performance, I'm sure. 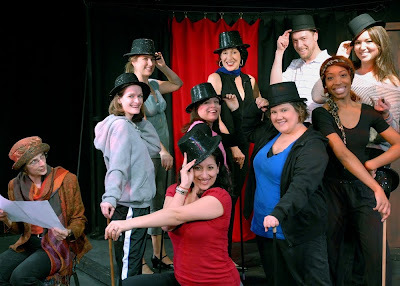 Stepping Out will run Saturday at 8 P.M., Sunday at 3 P.M., and next weekend Friday and Saturday evenings and a final matinee Sunday, April 22 at 3. Hudson Theatre Ensemble perfoms at the Hudson School, 601 Park Avenue. Go--and enjoy the show! Sometimes I think I'm just plain ornery because I seem to avoid things that everybody else really wants to do. I decided to make a list of them just to show myself what a contrarian I am. This is not a bucket list of things I would like to do, it's a list of things I don't care if I never do no matter how close I come to getting the chance. 1. Visit the Eiffel Tower. 2. See a production of an Andrew Lloyd Weber show. 4. Sit through a symphony. 5. Go skiing in the Alps. 6. Go to a rock concert. These are wonderful projects, things that anybody should want to do I suppose, but for the life of me I don't really want to do any of them. Before I began to feel bad about myself I decided to make another list, a list of things I'm pleased to say I have done and have treasured memories of. 1. Read all of Don Quixote. 3. Walked through Roman ruins in Switzerland. 4. Saw Ralph Bellamy in Sunrise at Campobello, Andy Griffin in No Time for Sergeants, Jack Lemmon in Tribute, John Lithgow in M. Butterfly, Kevin Kline in Cyrano de Bergerac, Ian McKellan in Wild Honey, Jane Fonda in 33 Variations, Sutton Foster in Anything Goes, Bernadette Peters in A Little Night Music and Follies, Carrie Fisher in Wishful Drinking, and the original production of The Book of Mormon. 5. Heard jazz at Tivoli Gardens. 6. Chatted with Ellis Larkins at the Carnegie Tavern. 7. Had cocktails with Ralph Bellamy and his wife. 8. Watched the fireworks at the annual Fête de Genève from a friend's balcony. 9. Learned to use a computer. 11. Saw JFK in person on the Senate floor. 12. Started two theatre companies. 13. Dined at Lutece, Taillevent, and Commander’s Palace (when Emeril Lagasse was chef). 14. Shook Jacqueline Kennedy’s soft hand at the Metropolitan Museum of Art. 15. Visited Rome and London by myself. 16. Flew to Paris for a weekend with a lover I hadn’t seen in 30 years. 17. Interviewed two American Ambassadors to Switzerland. 19. Raised a beautiful daughter who is one of my favorite people in the world. 20. Created a character called "Grandmama" for two really special young men. So it's mostly coming down on the plus side of the ledger. I'm not finished yet, not by a long shot, but as I started on the lists the good stuff kept coming to me. I can continue the lists, but let me suggest something to you, my reader: Make a list or two of your own, and share them with us on the comment page here. I'd love to hear what you've done in your life, what you've avoided doing, and which you're proudest of. I had heard there was soon to be a Broadway musical about Judy Garland. Why not, thinks I, we're so busy deifying actresses who can impersonate Marilyn Monroe and others of the era, and Judy is so accessible to the impersonator--ho hum. Little did I know. I picked up the review (if you can pick up an Internet posting) in the New York Times this morning of End of the Rainbow and was astonished to see a review that was nothing short of a rave from Ben Brantley. This is the paper of record for the theatre, and Brantley is a respected and articulate critic. I'm reading along, about how beautifully the play is written, how astonishing is the leading lady's (Tracie Bennett) performance, and I hit upon a familiar Hoboken name: Tom Pelphrey. He is playing Micky Deans, Garland's husband during her final slide into drug-induced, hysteria-laced darkness. Brantley says he is perfectly cast. This means he's done quite a job--going toe-to-toe with a dynamite actress playing the role of a beloved dragon--and he's made the shadowy part of an also-ran type guy into a remarkably living, memorable character. I first heard of Tom Pelphrey when he appeared in a one-man show in Hoboken called My Italy Story. My Hoboken theatre friends were blown away by his performance. It had run for only one or two performances in Hoboken, but I made it a point to catch it when it moved to The Barrow Street Theatre in the West Village. Tom peopled the stage with characters and held the audience in the palm of his hand as he described a young Italian American's journey to the village where his family lived in the hills of Italy. I came away somehow convinced that it was Tom's own story, that he was the one who had written it and was just relating his adventures in a vivid way. I look at the flyer I was given and see that it clearly names a playwright, Joseph Gallo, and identifies Pelphrey as an actor playing a role. He doesn't even have an Italian name. I'm thrilled for Tom. I'm thrilled that the play is good. And I'm thrilled to be back in Hoboken, where a trip to a Broadway play is just minutes away. I'm hoping to see this one.